Few sports can generate the kind of passion that football does. The strategizing to create the perfect game plan, the speed of play, and the sheer size of the players can create edge-of-the-seat excitement second to none. 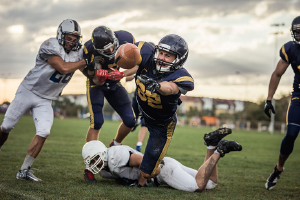 Due to the physical nature of the game, football does have its fair share of injures right from minor sprains, strains, torn ligaments and tendons to more severe fractures, concussions, and spine injuries. Protective Equipment: As football is a high-contact sport, wearing well-fitting protective gear is of paramount importance. You should always use good quality helmets, padding gear, mouth guards, athletic supporters, football shoes, and non-shattering eyeglasses. Conditioning: Ensure you are in good physical shape at the start of the football season by sticking to an off-season conditioning program that includes strength training, aerobics, and flexibility. It is also a good idea to get a pre-season physical to determine your fitness level before the football season. Pre-Game Warm Up: Going into the game with stiff joints and cold muscles is a surefire way of getting injured. Warmup with a light jog, jumping jacks, and do some range-of-motion exercises with emphasis on the shoulders, hips and knees prior to the game. Use Proper Technique: During the game, use proper time-tested techniques; for example, tackle with your head up and don’t lead with your helmet. This will significantly reduce the risk of traumatic injuries and fractures on the playing field. Cool Down with Stretching: After a training session or game, take a few minutes to cool down with some slow stretching exercises. This will keep you limber, reduce muscle soreness, and speed up your recovery. Hydration: Even mild dehydration hampers your athletic performance. Make sure you drink enough water before, during, and after the game. The general recommendation is you should drink about 24 ounces of water or noncaffeinated fluid approximately 2 hours before the game and take a water break every 20 minutes during play. If you experience any kind of pain, it is better to discontinue playing until your condition is evaluated and treated. This will ensure quicker return to the sport you love rather playing through the pain and risking serious injury that could put you out of the game for the whole season or perhaps longer.